Becoming a medical assistant means being an essential part of healthcare. Doctors, nurses, and patients will all rely on you on a daily basis. You’ll be the person who, in a very real way, makes caring and healing happen. 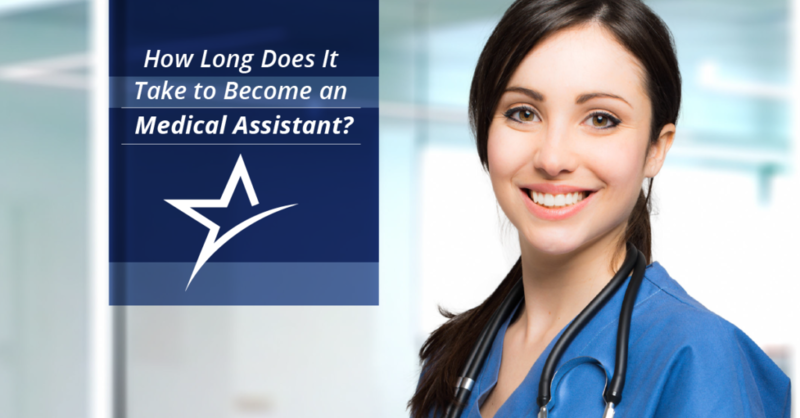 If you’ve ever wanted to provide this kind of care, this is how to become a medical assistant, and how long it takes. The first step toward becoming an MA is wanting to become an MA. Maybe working in healthcare is something you’ve wanted your entire life, or maybe it’s a recent decision you’ve come to after carefully weighing your career options. In any case, hearing the call isn’t enough. You have to answer it. That starts by requesting information about Ameritech’s medical assistant program. You’ll fill in some basic information, and an Ameritech representative will get back to you for an initial interview. In that interview, they’ll ask you some basic questions about who you are and why you’re interested in being an MA. After the enrollment process, the academic work begins. To meet the admissions requirements to be a medical assistant, you’ll need either a high school diploma or a GED. If you already have one of those, that’s great! If not, go get it! We believe in you. After that’s taken care of, it’s testing time. You’ll need to get at least a score of 13 on the Wonderlic Scholastic Level Exam. Or, if you’ve taken the ACT in the past two years, your composite score can also qualify, provided it is great enough. This is also the time when you’ll apply for financial aid if you need it. You’ll have options. It might be Title IV that gets you through Ameritech, or some other means of government funding, but you’ll be able to review your options and decide what’s best for you. Once you’re in, it’s time to crack the books. At Ameritech, you’ll become an MA over the course of six terms. Here’s the breakdown. The ins and outs of medical administration. In term five, you’ll learn all about microbiology and laboratory procedures, but you’ll also be learning more down-to-earth skills like employment strategies and how to take the national certification exam. It’s eight credits total. Your last term is the big one, even though it’s only four credits. During term six you’ll be out and about on your externship. All of this happens in about 45 weeks — so less than one year! Testing, networking, and landing that job! After almost a year of classes, study groups, tests, and the rest of it, you’re almost done. In order to become a Registered Medical Assistant you’ll have to pass a certification exam. At Ameritech, we prepare our students to pass numerous certification exams after graduating, including the Registered Medical Assistant (RMA), National Certified Medical Assistant (NCMA), Certified Medical Assistant (CMA), and Certified Clinical Medical Assistant (CCMA). After you pass, you’ll be ready to land a job. That’s where Ameritech definitely gives you an edge. Our MA graduates report 90 percent job placement! Medical assisting jobs are abundant and in-demand. We offer a reliable path to a stable and fulfilling career — all in one year’s time. If you want to be in demand, consider whether becoming a medical assistant might be the right choice for you. To learn more about our Medical Assistant program and others, visit our programs page or follow us on Facebook.